Super cute with the jar in the basket too! Love it Kitty! It is adorable! I did a copycat from Carlene also! She is an inspiration for sure. Love those little candles, now I need some of them for other vignettes. Carlene is a real hit today...everyone wants to copy her. I see why:) Very cute. Thanks for sharing. That is such a cute idea. I need to find some of those candles...they would love great with any decorations! You put together something special! I'm trying to get back to blog land. Love this ... great for Christmas or anytime. This is very cute, Kitty! Don't you just love the creative spirit out there; especially this time of year? 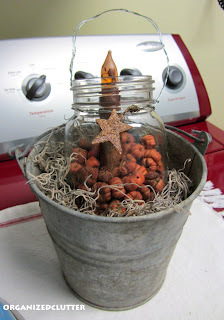 Canning jars are so versatile and I love using them myself for all sorts of things. I like the little Christmas Cheer blackboard sign too. Thanks so much for sharing this at my HOME and have a wonderful rest of the week, my friend. What a pretty blog you have! I'm visiting via Beverly's Pink Saturday. I like the creative way you put this candle arrangement together. Enjoy your Saturday!